We decided to visit Seiwasou as it had been highly recommended to me. Seiwasou is in the Fushimi area of Kyoto. Most of you have probably heard of Fushimi, but Fushimi is known for the 10,000 torii gates. I highly recommend visiting the 10,000 Torii gates while in Kyoto, it is unlike anything else in the world. Fushimi was once called “Fushimizu” apparently because it is naturally blessed with pure and clean spring water. 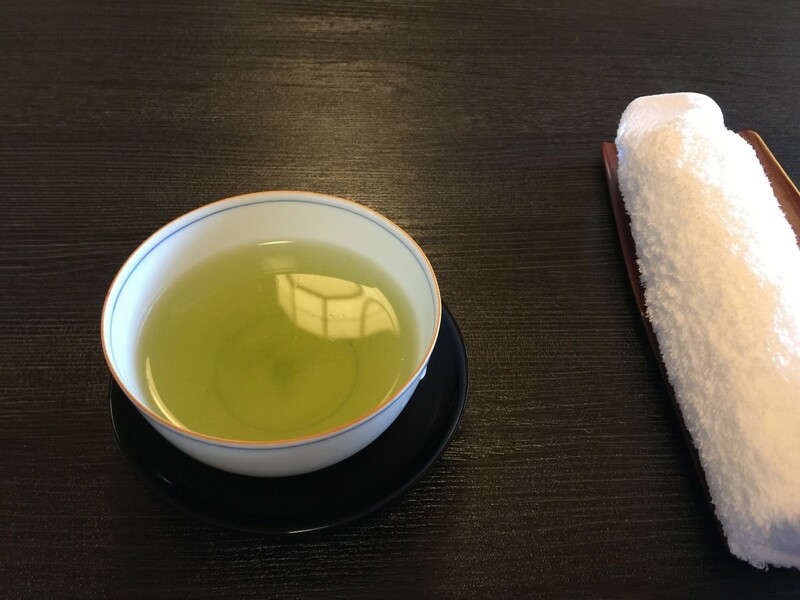 Uncoincidentally those places that have very clean and pure water, tend to have very good sake as well, and Fushimi was guaranteed to have good sake. I ended up taking the Keihan line and getting off at Sumizome Station, where it was about an 8-minute walk (apparently if you take the Kintetsu line and get off at Fushimi Station it is only about a 5-minute walk from the station). 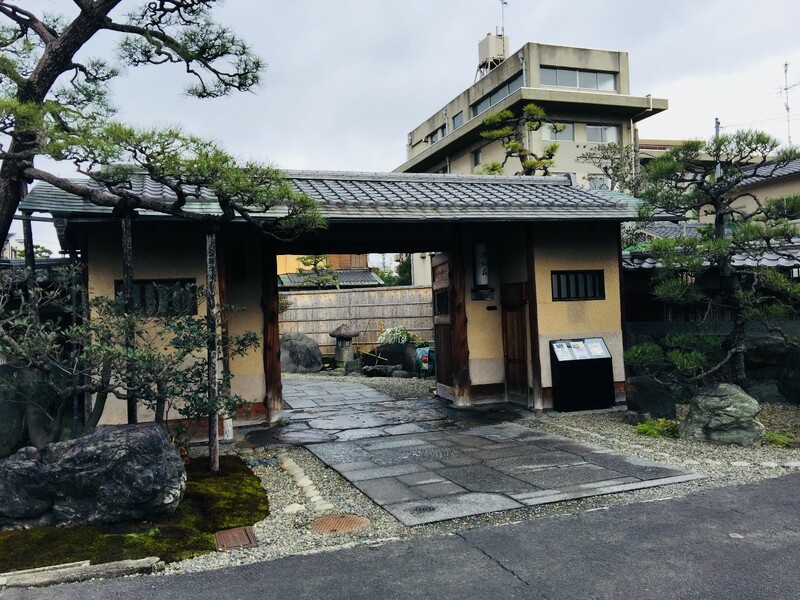 Located in a residential area, it was not too difficult too find the restaurant as it was basically a straight walk to the restaurant from the station. When we arrived at the restaurant, we almost didn’t recognize it, as it had looked like the entrance to a temple. We were surprised by how large the restaurant grounds were! The traditional garden is immaculately kept and I was told that workers take care of it daily. We were greeted at the entrance with a bow where we entered and took off our shoes at the front. 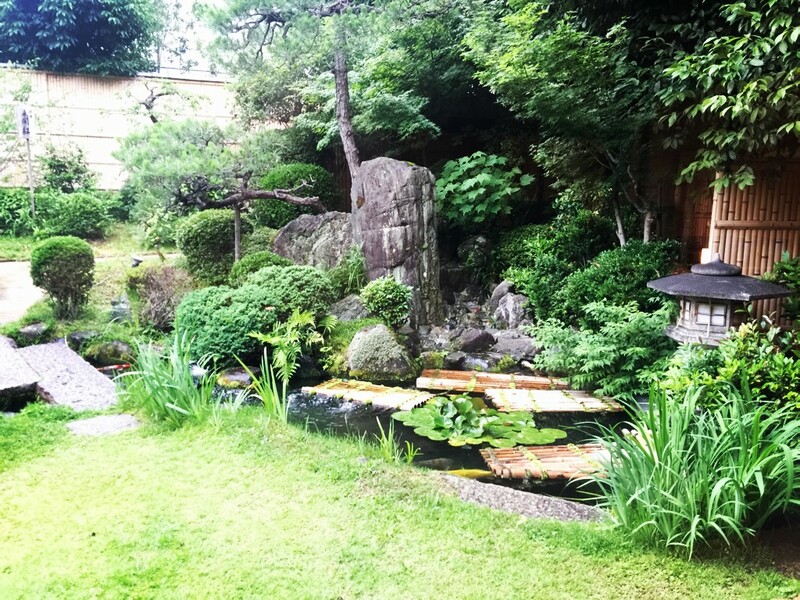 We were taken to a private room in front of the beautiful garden. Walking in the restaurant, seemed as if I were transported to ancient Japan. 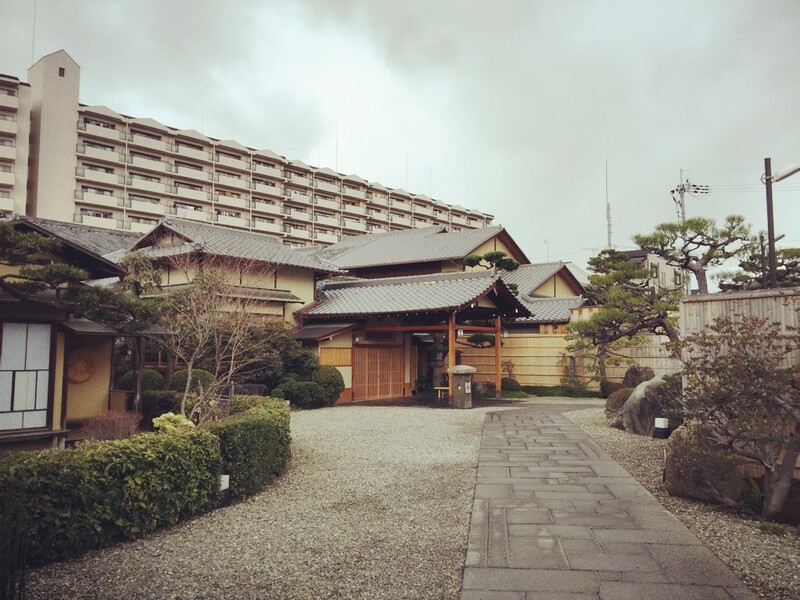 The distinct smell of the tatami and the reverberating echo of every step we took, reminded me of the ancient castles and houses I had visited in Japan. 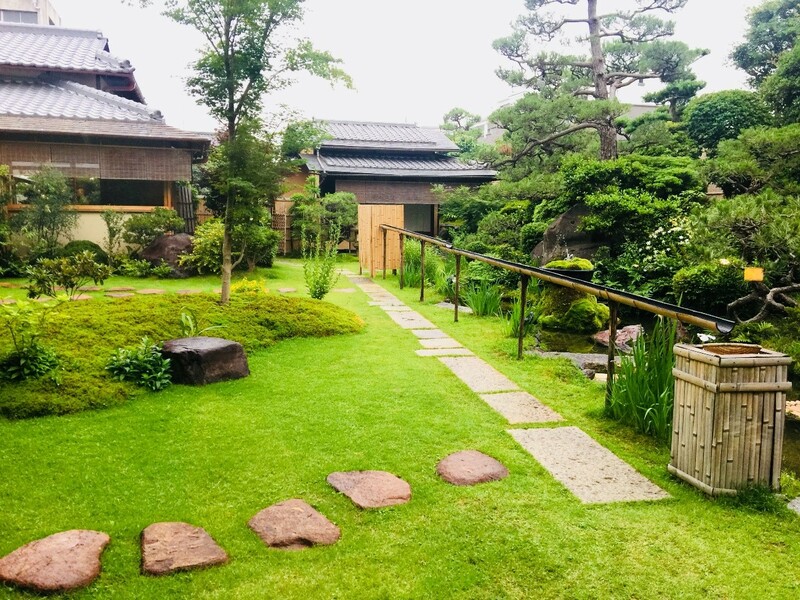 The waitress, clad in a kimono, gently opened the doors, greeted us and brought some cold tea and a cold towel, quite refreshing especially in the warm humid weather. 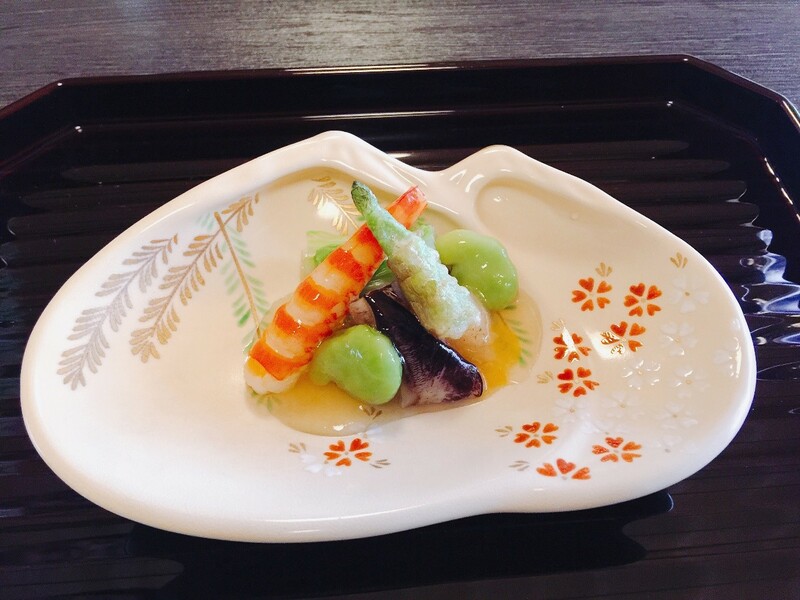 This is the “sakizuke”, an appetizer similar to the French amuse-bouche. 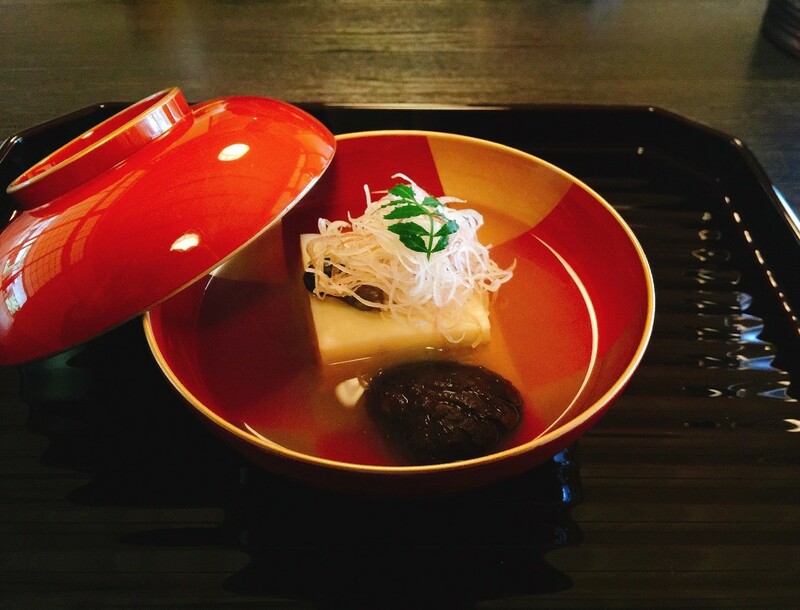 Next was the “hassun”, the second course which sets the seasonal theme. 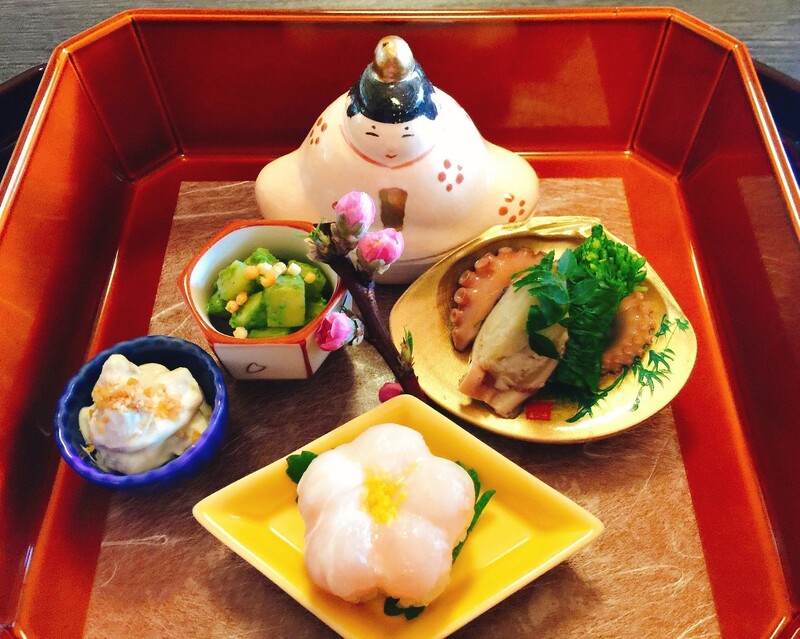 We visited in March, therefore the theme was “Hina Matsuri” or “girl’s festival”. Next was the “owan” or soup. This is the “Otsukuri”. 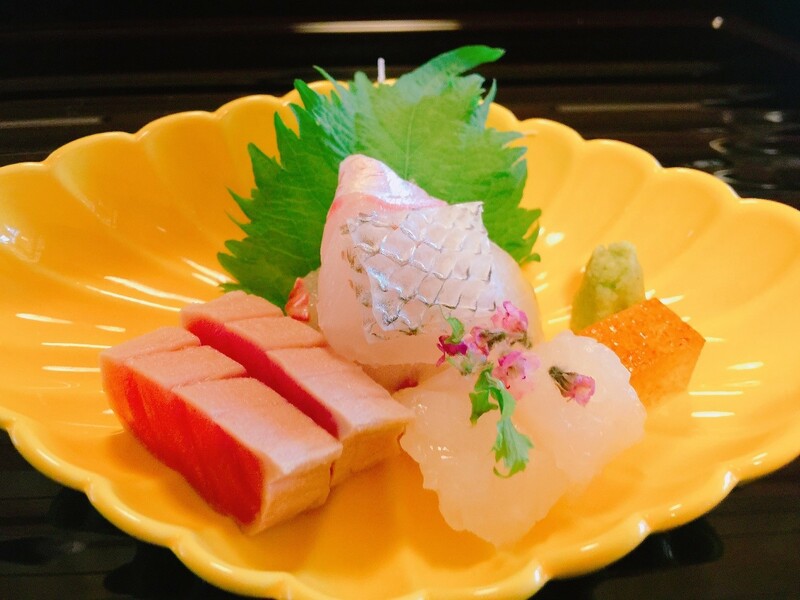 Basically it is a sashimi dish. This is “takiawase”. 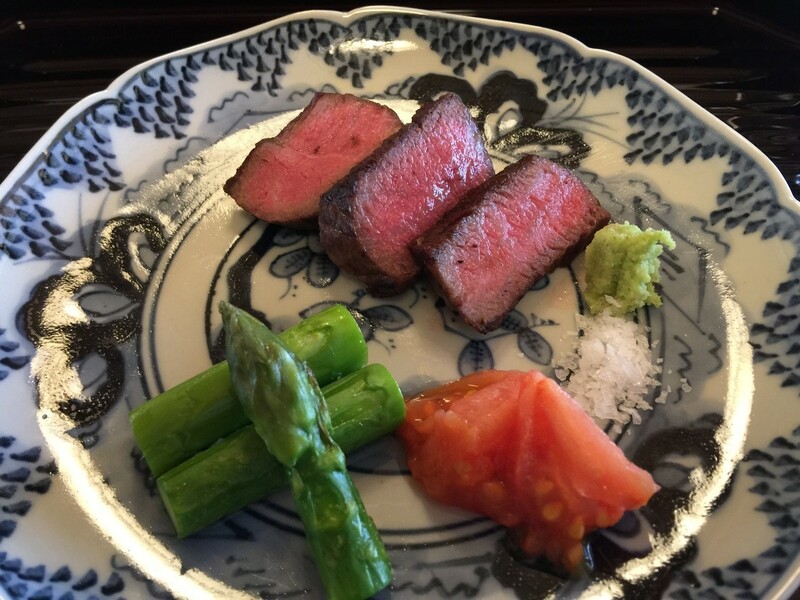 Wagyu, with some salt and wasabi on the side, as well as asparagus and tomato. I believe this is called “futamono” which is a soup. This is called “gohan”. 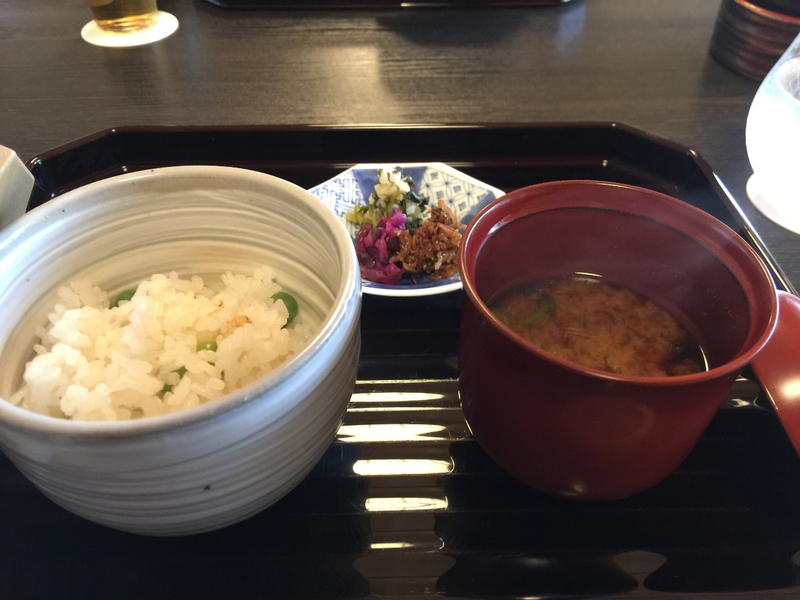 It is a seasonal rice. On the side are pickled vegetables, and miso soup. 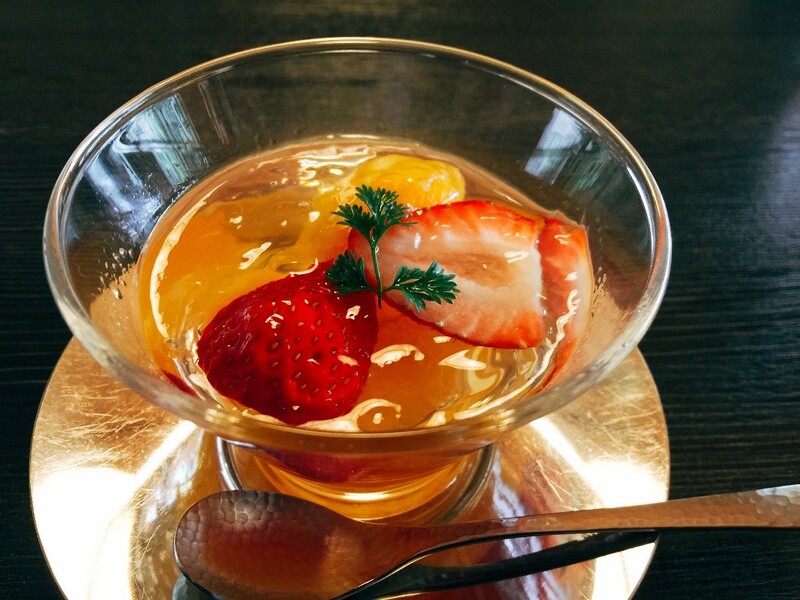 Next up is the dessert, a refreshing jelly with fruits dish. After this, was some “kinako mochi”. 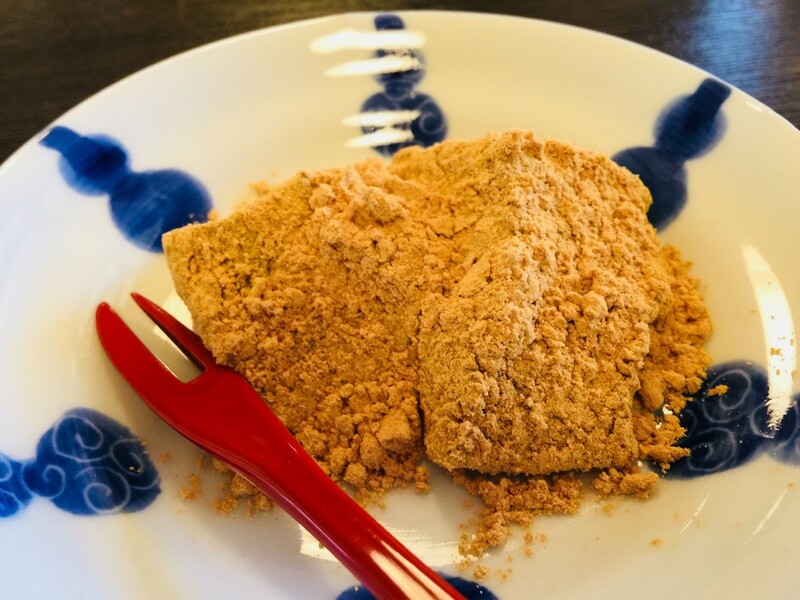 Kinako is a roasted soybean flour and is used in used in many traditional sweets and is very popular in Japan. 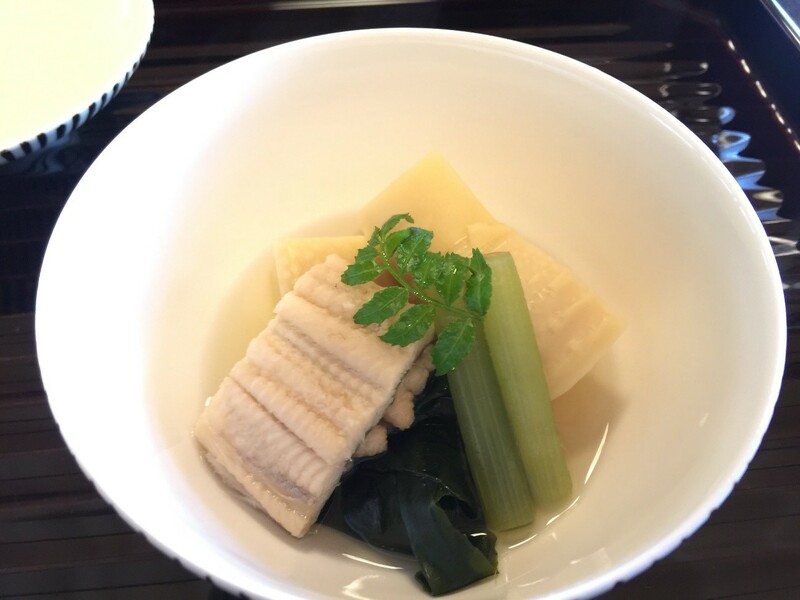 I have heard that Kinako is very healthy, because it is made of soybeans and also contains lots of Vitamin B and protein. The first appearance of kinako in Japanese history, was almost 700 years ago. 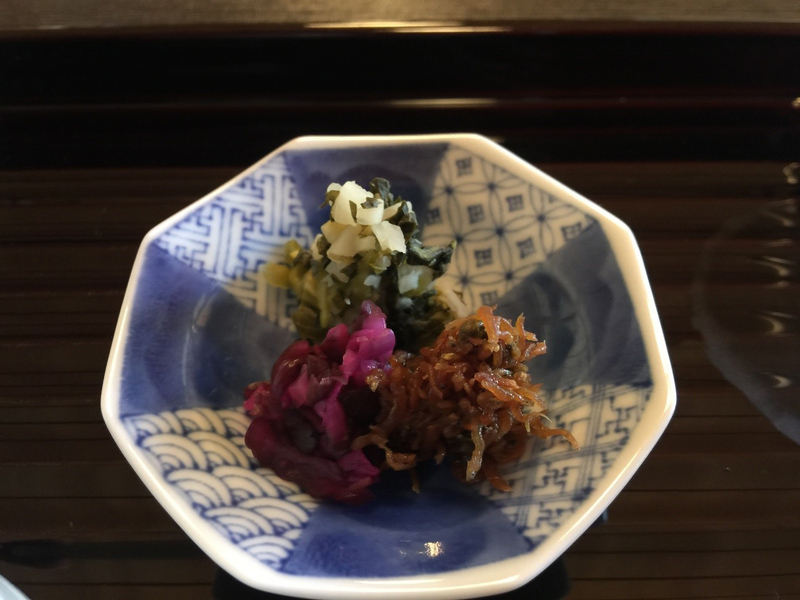 This may not seem like a lot of food looking at the pictures, but as I am sure those people that eat kaiseki are aware, it is very deceptive as one gets pretty full eating one dish after another. Also, typically lunch tends to be on the whole, smaller than dinner as people don’t want to be too full during the day. We had a slow stroll around the lovely garden before our meal and took some pictures afterwards as well. 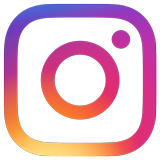 There are very few restaurants that have such a large beautiful garden, and the property itself is exceptionally large, as I was told that the restaurant can accommodate up to 250 guests. The meal more than lived up to my expectations and would definitely visit again.